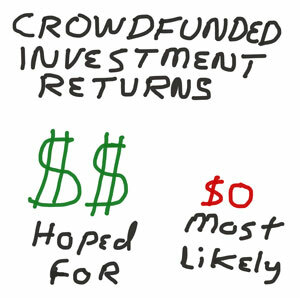 Home > Charles Rotblut > Is Crowd Funding A Good Investment Idea? Is Crowd Funding A Good Investment Idea? Effective this week, just about anyone in the U.S. can play the role of venture capitalist. New crowdfunding rules went into effect on Monday that allow non-accredited investors to risk up to $2,000 or 5% of their annual income or net worth (whichever is less) in a start-up company during a 12-month period. Those with annual income and net worth equal to or above $100,000 can invest up to 10% of annual income or net worth during a 12-month period. The Securities and Exchange Commission has a summary of the crowdfunding rules. Previously, investments in such companies were limited to accredited investors. Accredited investors have high net worth and/or large incomes. The Jumpstart Our Jobs (JOBS) Act of 2012 established new rules with the intent of giving smaller companies greater access to financing. In doing so, the JOBS Act created a mechanism for smaller investors to lose their cash. I looked at several crowdfunding platforms. Wefunder had the biggest selection of offerings, with 20 companies. The next-largest selection was on Start Engine, which listed 17. It’s still early, so I expect the number of offerings on various crowdfunding platforms to grow. I don’t have enough familiarity with the platforms to suggest which to focus on or avoid, so I encourage you to do your own due diligence before opening an account with one. Stick with only those that are registered with the SEC and FINRA and be sure to look on their websites for the CRD Number or ask them for it. Information about the companies operating the platforms should be available on the SEC's Investment Adviser Public Disclosure website. Could a crowdfunded company turn into the next big thing? Perhaps, but it’s not very likely. The failure rate for start-ups is high. As such, you should approach these companies with a high level of skepticism. Consider where they are in terms of business development, if they have an actual product currently being sold, what their revenue and profitability trends are and how competitive their industry is. You should also find out how the proceeds from the offering will be used, what rights as a shareholder you will have and how the company will keep you informed. Then, determine the proposed valuation. If a company is offering a 0.01% ownership stake for $2,000, it’s implying that its valuation is $20 million ($2,000/0.01% = $20 million.) This is math you may have seen done by the celebrity investors on “Shark Tank.” They run the numbers based on the requested funding amount to see if it is reasonable. Compare the offering amount to actual revenues (sales / assumed valuation). Then take a step back to simply ask if the number is reasonable from the standpoint of common sense. While doing so, realize your assessment will be far more art than science. Keep your guard up for both marketing and sample bias. The companies seeking crowdfunded investment dollars will do all they can to make their prospects sound great. Your job, as an investor, is to be Joe Friday and seek out just the facts. Having a prepared checklist of what you want to know before looking at any investment can be extremely helpful. Also, be cautious of any buzz you hear. Just because you know people who use the product or service or would be very interested in it doesn’t tell you anything about the actual size of the potential customer base or the company’s chances of success. Most importantly, only invest money you’ve set aside for gambling. This is speculation, not investing. You will lose everything on most crowdfunded investments. Any money you cannot afford to lose should not be spent on a crowdfunded investment. Just 16 members of the S&P 500 will report earnings next week as first-quarter earnings season winds down. Included in this group will be AutoZone (AZO), Hewlett Packard Enterprise (HPE) and Intuit (INTU) on Tuesday; Costco Wholesale(COST) and HP (HPQ) on Wednesday; and Dollar General (DG) on Thursday. On the economic front, the May PMI Manufacturing Index Flash and April new home sales will be released on Tuesday. Wednesday will feature March international trade. April durable goods orders and April pending home sales will be released on Thursday. Friday will feature the first revision to first-quarter GDP and the final University of Michigan consumer confidence survey. Federal Reserve Chair Janet Yellen will speak publicly on Friday. Also making public appearances next week will be St. Louis president James Bullard, San Francisco president John C. Williams and Philadelphia president Patrick Harker on Monday; Dallas president Robert Kaplan on Wednesday; Bullard and Governor Jerome Powell on Thursday. The Treasury Department will auction $26 billion of two-year notes on Tuesday, $34 billion of five-year notes and $13 billion of floating two-year notes on Wednesday and $28 billion of seven-year notes on Thursday.